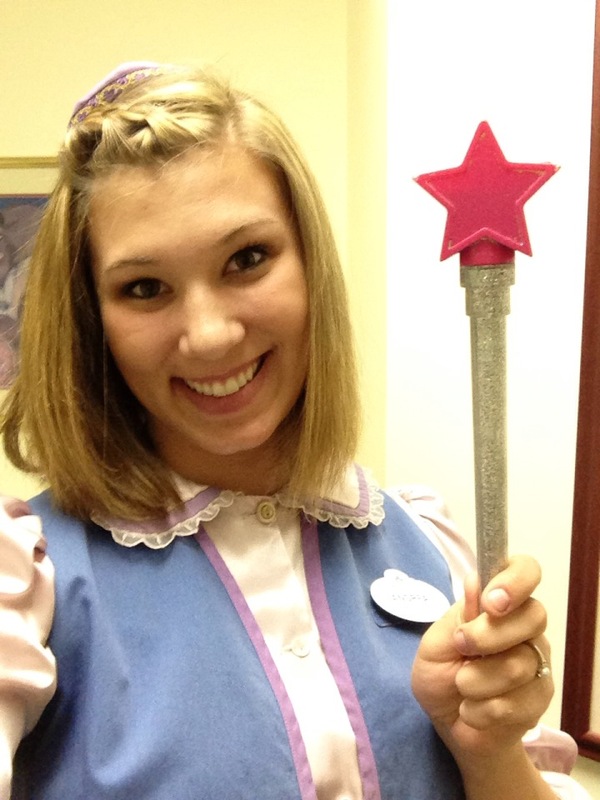 Ready for work with her wand full of pixie dust! Andrea was one of my friends I had met on Tumblr a few months before starting our program. She actually had participated in a previous program before Spring 2013, so she was always my life saver whenever I had any questions about the program! She was previously attractions working at Splash Mountain, but her heart belongs to the Boutique in Cinderella's Castle! It sounds like such a fun role! I worked at the Bibbidi Bobbidi Boutique in Cinderella's Castle. My typical day would start early in the morning- 7:30am, getting ready to greet princesses coming through our doors. our doors open at 8am and I am introduced to my princess. I get to spend about 30-45 minutes getting to know my princess and her family while I do her hair, makeup, and nails. When that princess leaves, I get to meet another! I'll sometimes help other FGIT's (fairy godmother's in training) by doing their princess's nails and makeup if I'm not too busy. This is the role I wanted! I actually only applied for the Bibbidi Bobbidi Boutique and I also applied for Character Performer. I didn't care which I got but those were the ONLY roles I wanted, which is why I only picked them! My favorite part about my role is pretty much everything. I can't tell you how many times I've been told "thank you so much for everything you've done" and "you've really made our trip amazing!". I make a direct impact on the lives of little girls and their families, and knowing that, makes me the happiest person alive. Of course this IS a job and it becomes a job. Meaning there are things to complain about, but in all honesty, none of them are worth sharing. The positives surpass the negatives by far. If I were to pick one negative though, I'd have to say it's very tiring. I'm hunched over all day long and because I'm a bit taller, my back always hurts when I leave. It's also extremely tiring mentally. I am a fairy godmother and that is my story line. If you were to ask anyone in entertainment, you would get the same answer. I am performing for 6 to 12 hours a day. I have to be on my game every moment I am onstage. I have to be quick with answers to questions you wouldn't even think were possible questions (for example: I once was asked how long Cinderella will live until she dies). When I come home every night from work, I mentally crash. But like I said previously, it is SO worth it. I have to pick just ONE magical moment?! Once I gangman-styled with a 3 year old. Once I was told by a 4 year old that she made a wish that MY wish would come true. Once I was hugged by a mom who told me that she hopes her daughter becomes half the woman I am. Once I danced with a 6 year old all over the Boutique until we got everyone laughing. Once I had a little girl remember me and run up to me into my arms and kiss my cheek. Once I had a little girl cry because she didn't want to let go of my hug and say goodbye. I just can't pick one. EVERY single day is magical. I just can't get enough! Ever since I was a little girl I've loved Disney. My ultimate dream is to dance down Main Street USA while riding on the Trolley and so growing up I've always known this is where I wanted to be. I came to Disney my senior year of high school with my school's marching band and during a workshop, they told us about the Program. Ever since then I knew how to make my dreams a reality! Is there something you wish you would have known before doing your DCP? I'm not going to lie, I didn't really realize this is a WORK internship. I mean yeah you know you're going to work but I certainly didn't realize how MUCH I was going to work. I wish I would have prepared myself more for working long (late) hours. Know your princess stories. Brush up on the princesses, their stories, their character traits... all stuff like that. You're going to get TONS of questions about them!! Like I said before, you will work. A lot. You will be spending about 75% of the time you're in Florida working. There are MANY opportunities to do the DCP. If you apply and receive a role that you don't think you'd like, DO NOT ACCEPT YOUR OFFER! You won't be happy. I LOVE going to work. I come home happy. I have talked to so many people who can't say that. The worst thing is that a lot of people start to dislike Disney because of their unhappiness. Don't let that happen to you. You can always reapply and have another chance to get a role you really want. Wait until you get your dream role. I did! If you have any questions for Andrea about her role or her program in general, you can reach her on her blog here! Hi! I loved reading your answers! I'm applying for Fall 2014 soon and my top role is BBB! I don't have too much hair or makeup experience as far as doing other peoples hair and makeup! Did you? Do you know if they sell that wand that she's holding? Did Andrea have to have previous work experience doing hair make up and nails to work at the boutique?